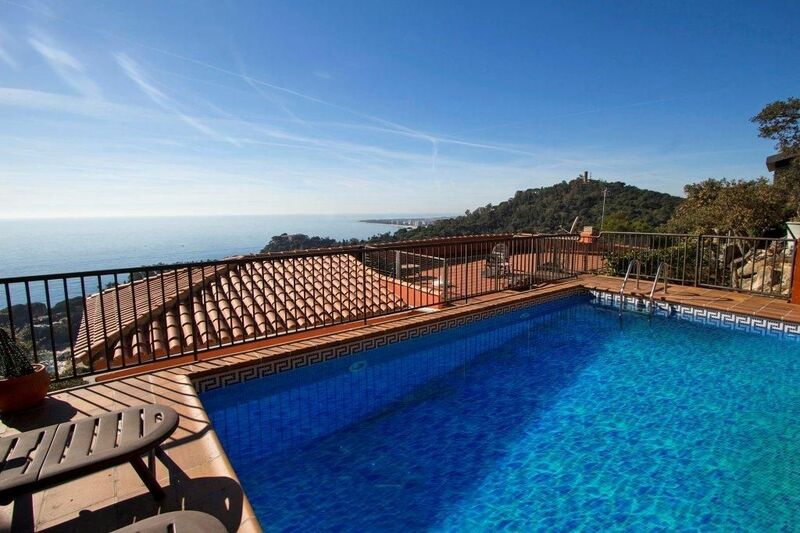 Catalunya Casas: Modern Villa in Blanes for 12 guests, with views of the Sea! Modern villa with sea views on the Costa Brava, ideal for families with children! This 4-bedroom Catalunya Casas villa provides the ideal setting for a comfortable family holiday near the beautiful beaches of Costa Brava. The villa features a terrace and covered porch area with a billiards table and outdoor lounge with sofas in which to relax and soak in the sea views. There is also a barbecue where you can cook up your favourite meals. Inside the villa, there is a living room and dining room with satellite television. A bright kitchen, also with satellite TV, offers a wonderful view while preparing your own meals using standard kitchen appliances you would find in your own home. The first three bedrooms are situated as follows: (1) one double bed and bathroom en suite (there is also satellite TV in this bedroom), (2) one double bed, (3) one bunk bed plus one large single bed for two people. There also is a bathroom with a shower separate from all the bedrooms. Within this private property there is a separate apartment area with satellite TV, a double bed, and a bunk bed, as well as a bright and practical kitchen. There is also one bathroom with a shower. This villa has no parking or a garage, but vehicles can be parked in the cul de sac outside the villa. Catalunya Casas specialises in hand-picked, exclusively managed family villa rentals (with pool and garden!) in Catalonia (Barcelona, Costa Brava, Costa Dorada) and the Balearic Islands. Our vacation rentals are close enough to tourist ‘meccas' so as to enjoy all the benefits these areas have to offer, yet far enough ‘off the beaten track’ where our guests have the opportunity to enjoy and experience the real Catalonia/Spain. *This house is rented from Sunday to Sunday from 21/07/19 to 26/08/19. *This house will accept 2 nights rental outside summer season. Please inquire! *Minimum stay is 5 nights in July.